A rigged democratic system, a “grotesque” military fighting unwinnable wars under the “drone commander in chief”, and the future of the movement behind presidential candidate Bernie Sanders were the focus of Day One at the Left Forum in New York City. This weekend’s theme “Rage, Rebellion, Revolution” brings thousands to John Jay College from Friday through Sunday. Journalist Chris Hedges, author and activist Tariq Ali, and Code Pink’s Medea Benjamin headlined the opening plenary with fiery remarks moderated by Laura Flanders. 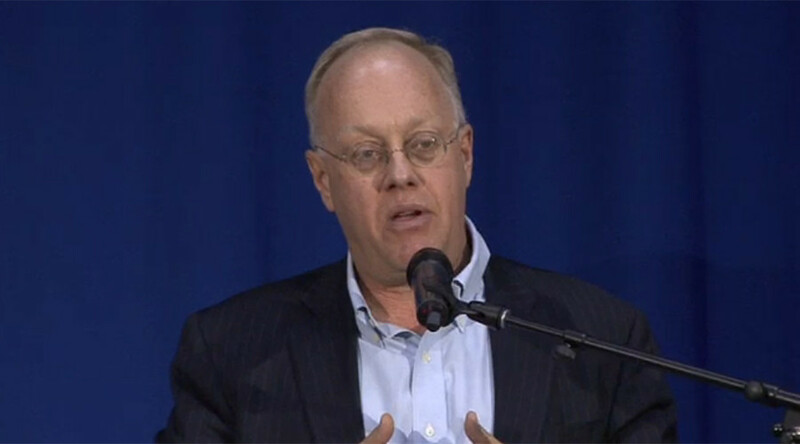 Chris Hedges, Pulitzer Prize-winning journalist and author, addressed the nature of power in the 2016 presidential election. According to Hedges, who doesn’t hold out hope for Sanders getting the Democratic Party nomination, said it was a mistake to run within that party and that both Sanders and his supporters are now dealing with the fact that the system is rigged. As for outgoing President Barack Obama, Hedges said his attack on civil liberties has been worse than that by George W Bush, pointing to his use of the Espionage Act. Medea Benjamin, the Code Pink activist known for infiltrating Congressional hearings and the Republican convention, started by disagreeing with Hedges’ opinion that Sanders should have run as an independent, describing the party as Clinton, Wall Street, and the weapons industry on one side and people who “really want the Democratic Party to represent their values and they are values that Bernie Sanders is standing for” on the other. Benjamin took an impromptu straw poll of those in the room, asking who was voting for Hillary Clinton, the Green Party’s Jill Stein, libertarian Gary Johnson, or Republican Donald Trump. Stein won by a huge majority, showing that the “lesser of two evils” argument may not force Sanders supporters to settle for Clinton. Her lovefest for the current president quickly ended when she referred to him as “the drone commander in chief,” reminding everyone of the way he spread “horrendous technology” and failed to reduce terrorism. While giving props to Donald Trump’s NATO skepticism, she emphasized, “Let’s not be fooled by Trump,” noting that his campaign built on Islamophobia, anti-immigration and the fact that he is open to bringing back torture. Benjamin ended on a positive by highlighting how the “localized economy” could replace the war economy, encouraging people to invest in credit unions, buy from local farmers, and choose thrift shops over sweatshops. “This is the kind of economy we have to build,” she said. Ali also took a wary view of London’s new Muslim Labour Party Mayor Sadiq Khan, particularly how his centrist views clash with Corbyn’s vision for the party. An early session on Saturday takes us inside the cooperative revolution in Jackson, Mississippi, which currently faces pushback from the Republican governor and state legislature. Green Party presidential candidate Jill Stein and Socialist city councilmember Kshama Sawant headline Saturday’s events, while Sunday features what promises to be an electric conversation between Democracy Now host Amy Goodman and public intellectual Slavoj Žižek. Shandre Delaney, mother of Carrington Keys - one of the Dallas 6 who took a stand against prison abuse at the hands of officers in a Pennsylvania state prison, and a coordinator of the Justice for the Dallas 6 Support Campaign, will also be taking part in panel discussion on Sunday entitled "Leadership and Power for the Movement for Prisoners’ Rights, and against Solitary Confinement." Others in attendance over the weekend include Debra Sweet from the World Can't Wait group, which, as per its website, aims "to halt and reverse the terrible program of war, repression and theocracy that was initiated by the Bush / Cheney regime and the ongoing crimes."